My all-time favorite racket that is the Kansas City, MO earnings tax is in the news again and since I enjoy a good debate as much as the next guy I might as well put in my own 2 cents. I don’t consider it any more then an exercise in debate because I don’t expect the tax to be repealed any time soon. People of Kansas City may not be able to elect competent officials who can run an efficient city, but they know what’s good for them when it comes to $200 million of other people’s money. As always the Kansas City Post wrote a thoughtful and not just an emotional post so I felt like participating in the discussion. Obviously there are a lot of misinformed people who think that the e-tax is somehow makes out-of-towners like me share the burden of using the infrastructure and amenities that Kansas City has to offer. 1) Do you use the toilet at any time you are in KCMO? 2) do you use water to wash your hands or make coffee? 3) Do you drive on our streets and rely on drainage systems to keep them from flooding? 5) What about the police, firemen and EMTs you would rely on if there were an emergency at your office? Consider your e-tax your little share of the burden. This is misguided but common sentiment. The building where I work pays utilities and property taxes, which my company passes on to its customers. This covers all my coffee, toilet flushes, hand washing and use of the street lights. If I am using a business like a bar or a gas station these expenses are built in the prices of goods and services. There are no free toilet flushes in this country and someone other than a taxpayer always pays for them in one form or another. Property and sales taxes also cover police and firemen, and EMT will promptly bill my medical insurance. Even if it wasn’t true, when any KCMO resident leaves the city limits he or she is using the same and probably better services without being charged, so at the least we are even. In these kinds of arguments people always mention the sport teams or other entertainment venues such as Sprint Center and Power & Light, theater district, the Zoo and other points of interest located in Kansas City. All these places are not free and if the cost of tickets and parking does not reflect the true operating costs they should just raise the prices and let people decide if they can or cannot afford the ticket. The same goes for the KCI airport which charges its own taxes as a part of the airline ticket; Downtown Airport expenses are included in the price of the UPS or FEDEX delivery services; pretty much anything you can name should not be subsidized by the city. As a matter of fact, I don’t think anyone asked Kansas City to subsidize these businesses and attractions, they chose to do this in order to generate sales taxes, create or keep local jobs and don’t need to act like they are doing just because they are so nice and neighborly. Then there is always someone who would accuse me of being against all taxes, but that’s not true: I pay income taxes in Missouri but don’t complain about it too much because it works both ways, Missourians who work in Kansas pay taxes there; unpleasant but fair. All the childish arguments aside, the only real reason for the e-tax is that it helps the residents to live in the city without paying the true costs needed to sustain the necessary services and infrastructure. If the tax is repealed, the general fund will be shortchanged by some $200 million with all the catastrophic consequences this may cause. 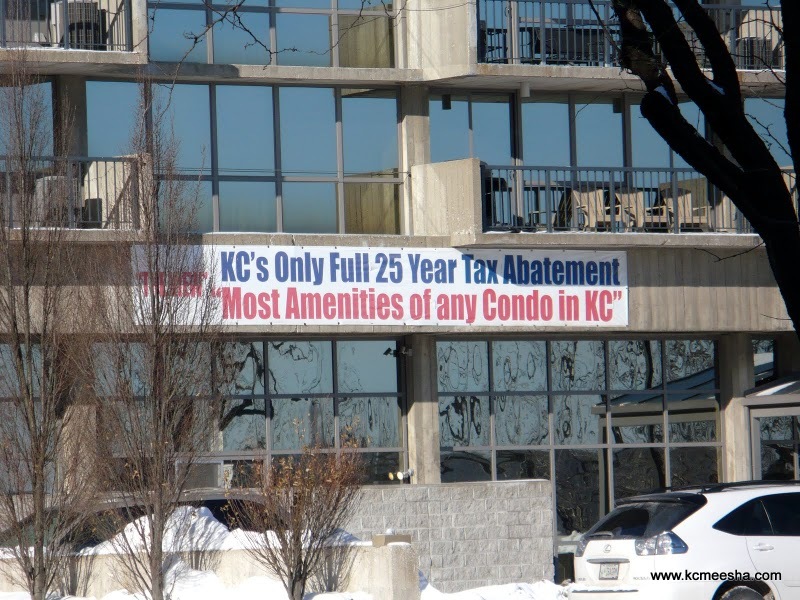 The only problem is that while people like me are being robbed in order to maintain the general fund, many Kansas City residents don’t even have to pay property taxes. This is the building I see every day across the street from my work. Like a big middle finger from the city of Kansas City,MO it reminds me every day that the politicians who run it find it easier to take money from the people who have no vote in the matter, than resisting the developers, or sport franchise owners or corporations who instead of contributing to the general fund, prefer to contribute directly to the politicians in charge. 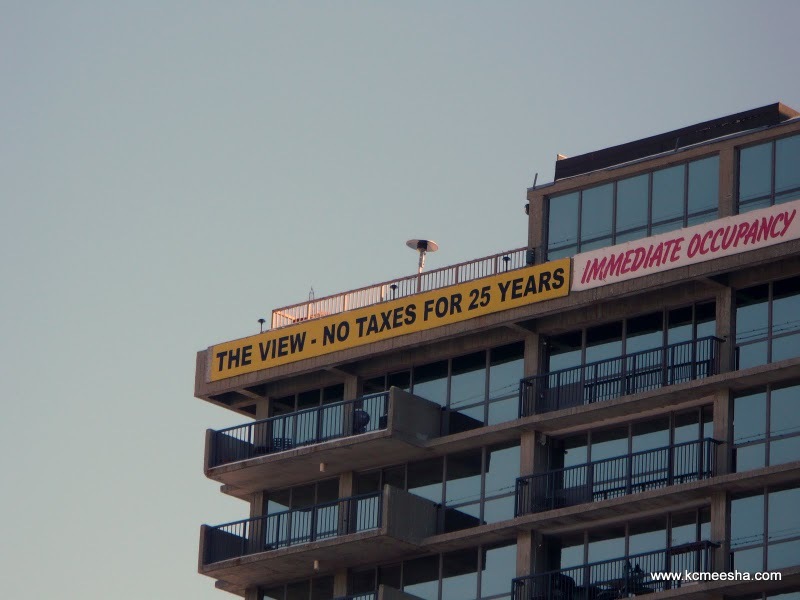 The 25 year tax abatement is featured prominently on every side, high and low. 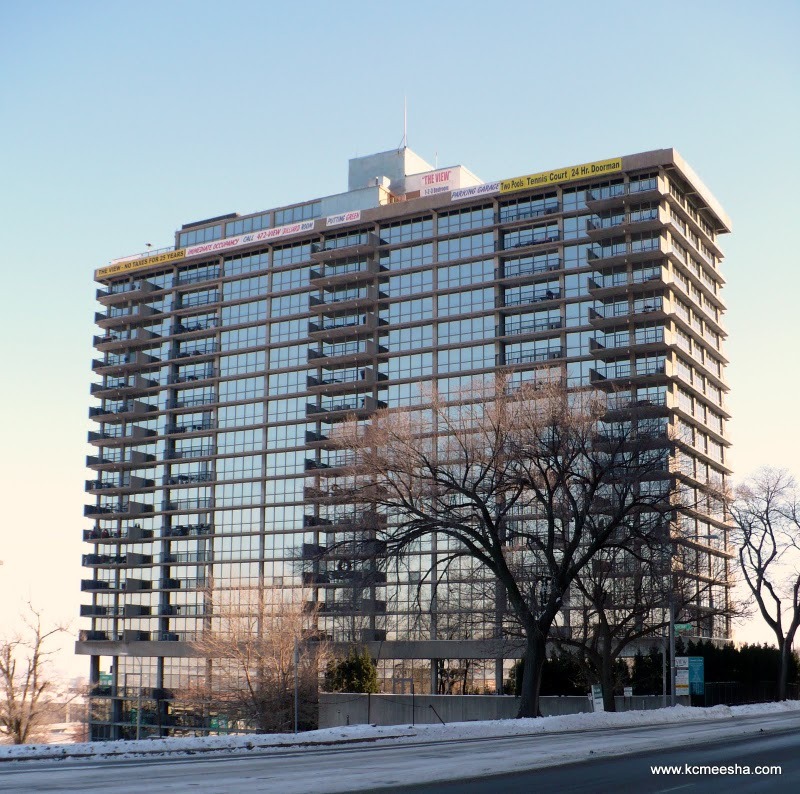 The residents of this building are not poor, some condos are on the market for $300K and up with the penthouse possibly valued at $2 million. These are the proverbial “rich, the “top 1 percent”, the ones with deep pockets who should be contributing their “fair share” and yet they get to see me out of their panoramic windows, paying for their toilet flushes, stoplights and sports teams. I am not completely heartless (depending on who you ask) and I am willing to be forced to help my Kansas City neighbors who frequently entertain themselves by making snide remarks about the suburbs, while firmly keeping their hands in the pockets of people who live there. I always maintained that there are ways to make me feel better while being screwed, it could be free parking at the P&L or a discounted ticket to an event. I am not asking for much. For example many attractions in St.Louis are free, although not just to taxpayers – to everyone, but it’s still someting. 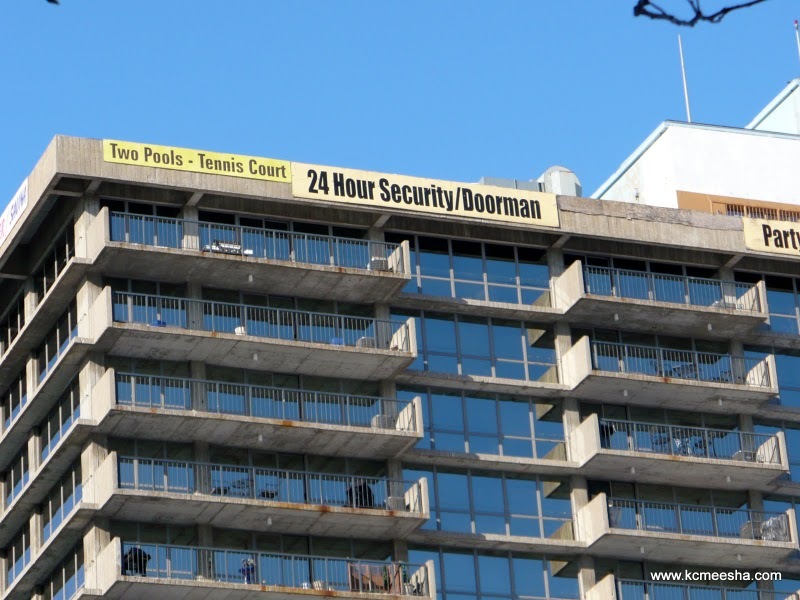 In the meantime you don’t have to buy the stories about the impending doom and gloom if the e-tax gets repealed, the city has plenty of money to pay for the party room with a panoramic view, two pools, a tennis court and a 24-hr security/doorman. Maybe in the same pile they can find a couple of dollars to plow your street. And see if they owe you a refund.